"Note: The road has no guardrails and is unsuitable for trailers and some RVs. Only experienced mountain drivers should attempt it. Phone ahead for road conditions. An 8-mile section of the road is closed due to a tunnel collapse. Old Stage Road provides a detour. Time: Allow 2 hours, 30 minutes." Two and a half hours to drive 36 miles?? Now there's a clue to road conditions, and I'm assuming that's when it's dry. More about Gold Camp Road below. This is kind of a hodge-podge of remaining activities I either did today, did recently, and/or want to do in the Colorado Springs/Pikes Peak area on our next visit here, possibly later this summer. This is more travelogue than sport, although I'm including some more recreational information. The first three places are an adjunct to my journal entry about Garden of the Gods. After hiking and driving around this morning I also visited the Garden of the Gods Trading Post on Beckers Lane at the southern edge of the park property. 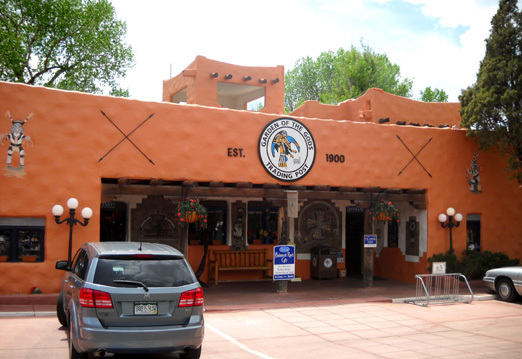 The original trading post was built in the early 1900s by local Indian-goods trader Charles E. Strausenback to resemble the homes of the nearby Pueblo Indians. 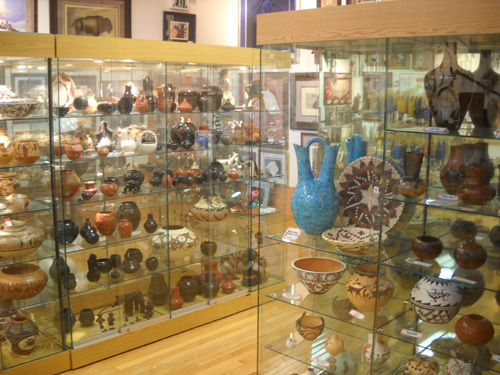 Through the mid-1950s, Native American silversmiths and artisans worked and lived at the trading post making jewelry, weaving blankets, and creating pottery. About thirty years ago TAT Enterprises, Inc. took over proprietorship of the trading post. The company has been renovating and expanding the original building ever since. Some of the original decorative fixtures and features can still be seen, as well as old photographs of the building and interior. 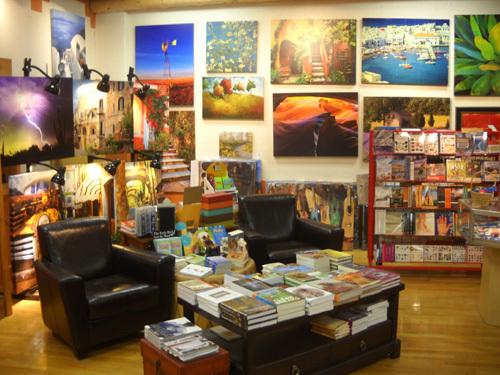 I pretty much ignored the touristy gift shop and patio cafe (despite the lure of getting some buffalo chili or a buffalo burger), but enjoyed browsing the books . . .
Because of poor timing we weren't able to visit this living history museum and working farm just inside the east entrance to Garden of the Gods. The site is closed on Mondays and Tuesdays, the days we were at the park this week and last. It is listed on the National Register of Historic Places. When the site is open, interpreters in period clothing depict pioneer and American Indian life in the Pike's Peak Region. 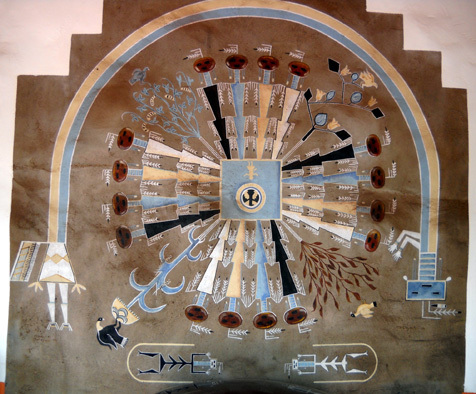 Displays include a 1770s Native American (Ute and Plains Indians) camp, the 1860s Galloway homestead, the 1880s Chambers home and ranch, a 19th century blacksmith shop, and a 1907 Edwardian country estate built by the founder of Colorado Springs, General William J. Palmer. I'd like to visit Rock Ledge next time we're in the area. The cost is $6 for adults, $4 for seniors (65?) and students, and $2 for kids 6-12. I assume it's free for kids under 6. 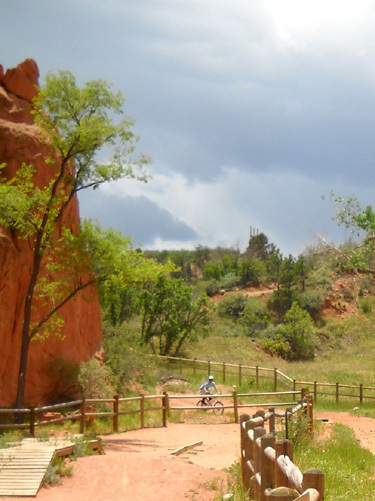 You can purchase tickets at the Garden of the Gods visitor center or at Rock Ledge Ranch. 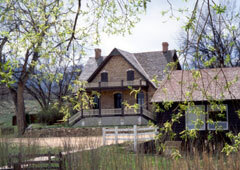 There are at least two good websites with additional information about Rock Ledge Ranch and special events held there: http://www.rockledgeranch.com/ (Living History Association, which privately supports the historic site) and http://www.springsgov.com/Page.aspx?navid=2092 (City of Colorado Springs, which manages the historic site). Most of the rocks in Garden of the Gods are shades of pink, orange, and red. Outside, there are some in the off-white/tan and gray color ranges. All of them are a beautiful contrast to the bright blue sky, white (or gray!) clouds, and just about every shade of green there is. Oh, yes. These are the Rockies so you can expect a storm to blow in over the mountains almost every summer afternoon. Today was no exception. Angry-looking clouds were darkening the sky to the south while I was taking the photos above. So guess where I was headed next?? I wasn't intentionally heading into a storm this afternoon. 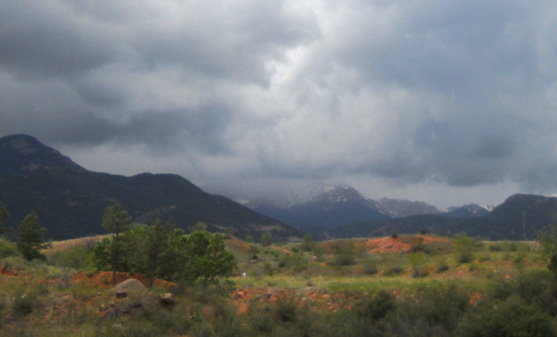 I just wanted to see some of the other red rock parks and scenic mountain roads southwest of Colorado Springs and our time in the area was quickly running out. My next stop was another City of Colorado Springs park that is free for the public to enjoy. 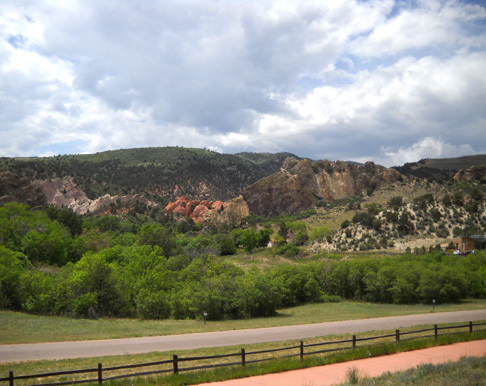 We've driven by the large parking area for Red Rock Canyon on US 24 between Manitou Springs and the western edge of Colorado Springs several times but have never checked it out. We still haven't run or hiked there, but at least I got a gander at the trailheads and picked up a brochure with a good trail map inside. The Red Rock Canyon area is characterized by a series of canyons and ridges sculpted by erosion of the area's uplifted rock strata. The ridges and canyons offer beautiful views and sheltered enclaves for inspiration, varied terrain for recreation, and a 240-million year slice of geologic time for education. The varied terrain and geology support a wide variety of plant and animal communities. Human use of the area has left a heritage of diverse and colorful history including Ute defensive positions, stone quarries, and gold mills. 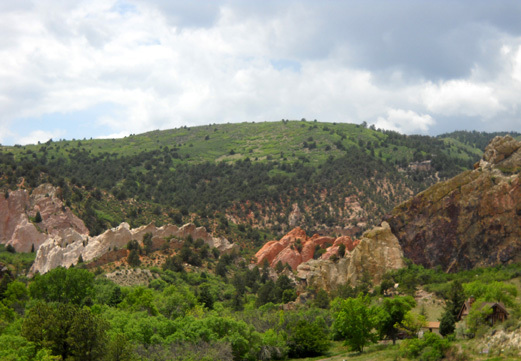 Red Rock Canyon is part of Colorado Springs' 14,000 acres of park lands and open spaces. Fourteen thousand acres!! I'm totally impressed by that. I think Colorado has been very wise to protect so much land all over the state. "Open spaces" have several characteristics: they are in a primarily natural state, they contain significant natural, aesthetic, or cultural features that warrant protection, and they are permanently protected. 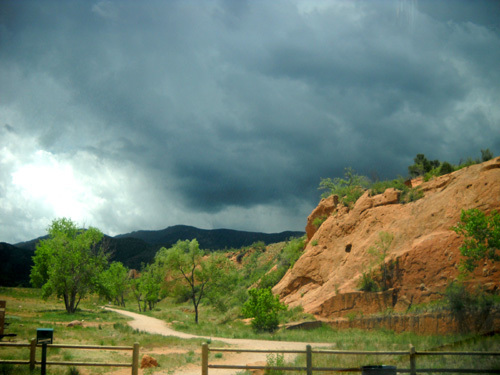 Red Rock Canyon was purchased by the City of Colorado Springs in 2003. 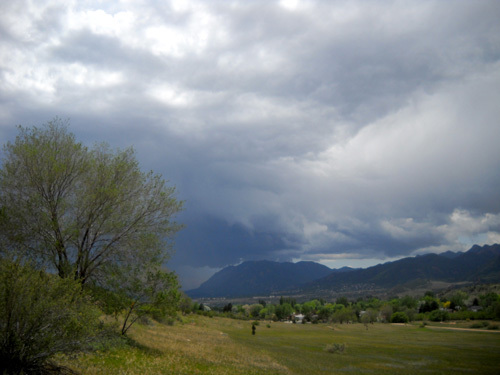 It connects to two other protected spaces, Section 16 and Bear Creek Ca�on Park, which adjoins the one million-plus acres in the Pike National Forest. 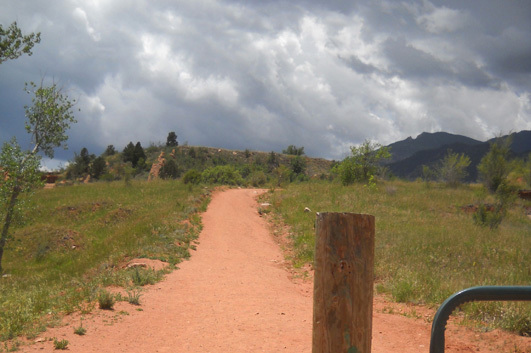 That means you can park your vehicle at Red Rock Canyon and hike/run into the national forest. 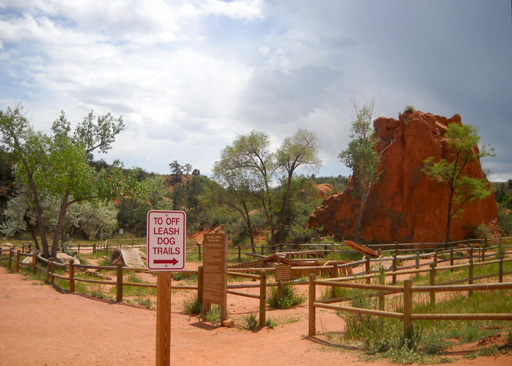 Red Rock Canyon offers about 13 miles of multi-use trails for hiking, running, mountain biking and horse riding, off-leash dog loops, a bicycle free ride area, rock climbing, a picnic area, an open-air pavilion, and educational resources. According to the trail map, there are two pedestrian-only trails. One is called the Garden of the Goddesses Contemplative Trail. There is also a "bicycle free ride area" that is only for cyclists who want the extra challenge of riding over teeter totters, drops, and skinny bridges. Part of that course is shown in the next three photos. Dogs area allowed on the trails but must be on-leash except for two very short off-leash dog loops that total less than 5/8 miles of trail. Guess Cody-the-ultra-Lab will have to be on a leash to get in the miles he'll want! Four more miles of trails are planned at Red Rock Canyon. 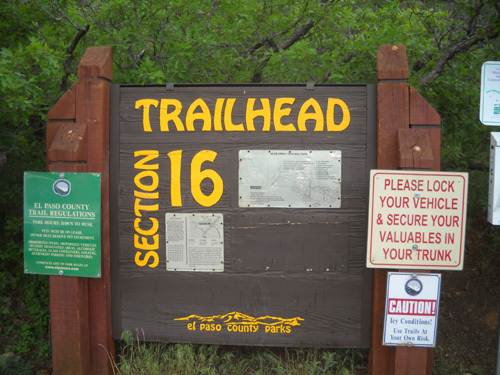 The Mesa and Greenlee trails already connect to trails in Section 16 and more trails will be added in a new open space called White Rocks. There are 85 established technical climbing routes in Red Rock Canyon. Climbing is encouraged but folks must register at the Garden of the Gods Visitor Center first and have proper equipment. A cyclist returns to the trailhead near the free ride area. As with Garden of the Gods, there is a non-profit volunteer organization, Friends of Red Rock Canyon, that helps the city parks and recreation department with advocacy and community outreach (fund raising, special events), education, and stewardship (trail maintenance, protection of the resources). You can find out more about this group at this link or the City of Colorado Springs website. We plan to explore these areas on our next visit. Until I'm able to take photos, here are some scenic pictures taken by two photographers of the Red Rock Canyon area. So by now the advancing storm is on my side of Pike's Peak and continues to rage to the south of Red Rock Canyon. That's where I'm headed to find the northern part of historic Gold Camp Road . . . 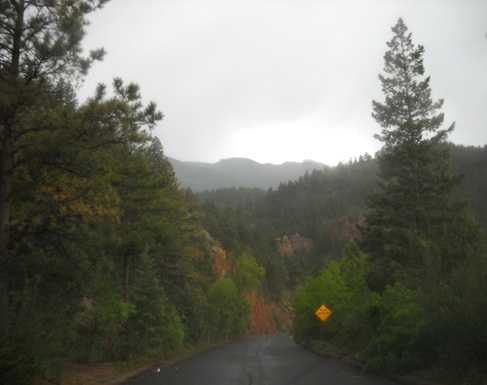 I've driven on Gold Camp, High, and Cheyenne Canyon roads previously but it's been so many years ago that I wanted to go back. I've also forgotten in the ensuing years just how narrow and rough those roads are! It became very clear after it began raining that narrow dirt roads high on a mountainside are not advisable during a downpour. I was alone and I didn't want to get stuck in the mud somewhere. So that little excursion got cut short after less than an hour.
. . . a narrow, twisting, 36-mile gravel trail that follows the Cripple Creek Short Line Railroad roadbed through North Cheyenne Canyon. President Theodore Roosevelt described it as the "trip that bankrupts the English language." It is a favorite scenic route for cyclists. Sounds like my kind of road trip! There's also the quote at the top of this entry that warns drivers about road conditions. Hmmm . . . 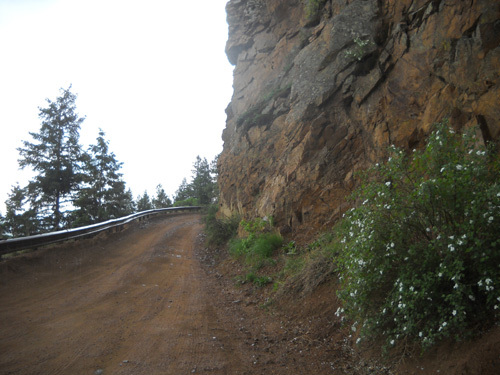 I can't vouch today for Old Stage Road, High Road, or Cheyenne Canyon Road, all of which connect to Gold Camp Road to make a big, convoluted scenic loop, because I didn't get there. Weather conditions, lack of time, and a tunnel collapse in North Cheyenne Park made those off-limits today. I have been on them previously, however, and they are indeed awesome. Did I explore that trail? Nope. Much as I wanted to, that's when it started raining on my parade. I can't even show you any great photos of the mountains through Bear Creek Ca�on Park property or down into the huge valley as I drove higher and higher on Gold Camp Road -- they came out dark and crummy in the rain and fog. I drove back down toward the intersection with High Road (which goes one way the other way) . . .
. . . continued past Bear Creek Ca�on Park, and turned right on Lower Gold Camp Road, which is paved and urbanized. By then it had stopped raining but I decided to save any further exploration of Bear Creek or North Cheyenne parks for another trip. These two regional parks cover a lot of territory and warrant several hours (days?) to explore. 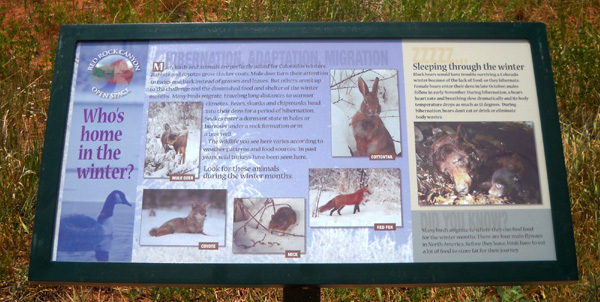 There is a nature center at Bear Creek that features self-guiding nature trails, hands-on interactive Colorado wildlife exhibits, and multimedia nature films. It is free. North Cheyenne Ca�on Park has distinctive rock formations and waterfalls, including popular Helen Hunt and Silver Cascade falls. Hiking and biking trails are available; some are quite challenging. As at other city and regional parks in the area, technical climbing requires a permit and proper gear. There are two visitor centers. The one at Starsmore Discovery Center has exhibits about area wildlife and park history. Both centers offer nature programs. I'll put both parks, and the scenic roads that connect them, on my list of Things to Do Next Time we're here. This evening on the news I heard that parts of southwest Colorado Springs got hail and were flooded. Although I was in the southwestern part of the metro area I'm glad I dodged that bullet. All I got into was some rain. 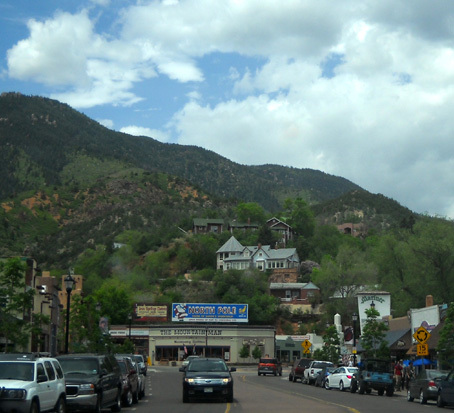 Another place I drove through quickly this afternoon, before the rain began, was "downtown" Manitou Springs. 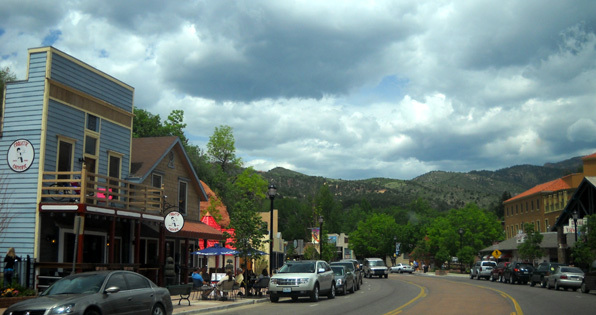 This little town of about 5,000 residents sits at the eastern base of Pike's Peak. 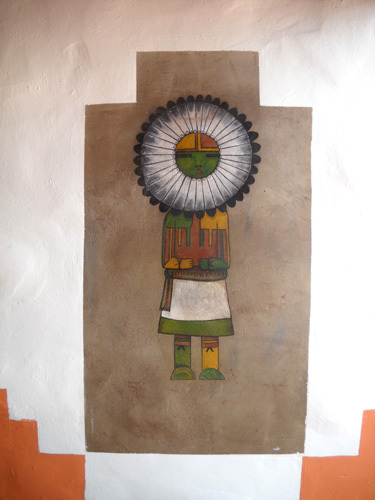 Native Americans named the mineral springs for which the town is famous for the Great Spirit Manitou. 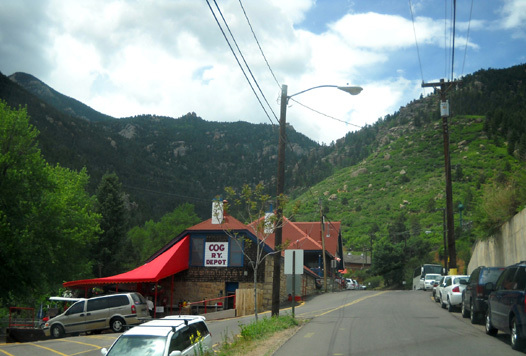 To really see the old buildings and shops you need to get off US 24 and onto Manitou Avenue. I've walked through most of the streets in this little town before and just wanted to see the main street briefly today. I didn't take time to go into any of the shops. These pictures are "windshield shots." I couldn't find a place to park along the main drag -- on a Tuesday afternoon, no less. If you visit in the summer, get there early and be prepared for a lot of walking because it isn't practical to move your vehicle once it's parked near the main shopping area. Also be aware that the streets in the historic area, especially residential streets, are very narrow and you might have problems navigating and parking a medium- to large-size RV. There are a couple of RV parks and parking areas off Manitou Ave. before you get into the heart of the town. Park your camper there and walk or drive from there in your small "toad" (towed vehicle, in RV-speak). 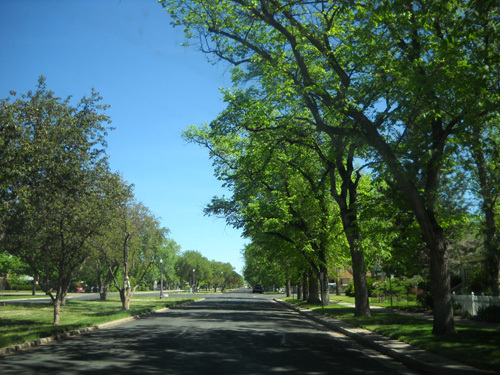 Another day Jim and I drove through what is considered one of the oldest and nicest neighborhoods in Colorado Springs. The homes lie in an area on or near Cascade Avenue, between Monroe to the north and Unitah to the south. This was the "respectable" side of town back in the heyday of the mining boom and the raucous life several miles west in Old Colorado City. 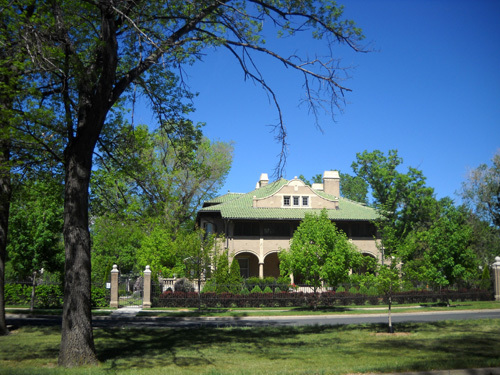 General William J. Palmer and his associates with the Denver & Rio Grande Railroad were mostly responsible for laying out this planned community with broad boulevards, parks, school lots, and space for a college in 1871. It was centered at Pikes Peak and Cascade Avenues. They dug irrigation ditches, planted thousands of cottonwood trees, and built nice Tudor homes and gentlemen's clubs for the rich gentry who settled in the neighborhood, which soon became known as Little London because it was a playground for the wealthy. Per the 2010 AAA Colorado-Utah TourBook (p. 49), "When not playing cricket or attending social functions, these Britons and their American counterparts speculated in mining. They made millions, especially after the bonanza in Cripple Creek. The city benefited in the form of parks, office buildings, mansions, and hotels. By the first decade of the 20th century, Colorado Springs ranked among the wealthiest cities per capita in the country." I'd like to do a walking tour of this area sometime so I can see more architectural and landscaping details. 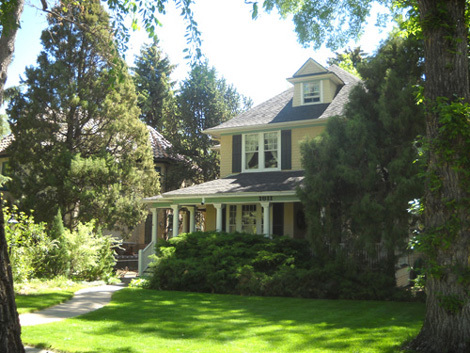 If you're interested in historic homes and other buildings, this web page lists all the addresses on the National Register of Historic Places in Colorado Springs. Hike ~ 13 miles up Pike's Peak from Manitou Springs to the summit and ride back down with Jim in the truck; he can run down to meet me on the trail and walk back up with me. 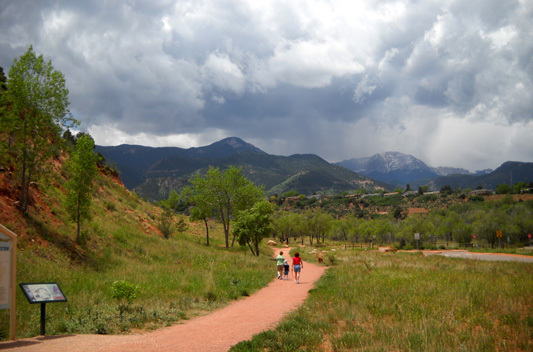 Hike all or part of the New Santa Fe regional trail, which stretches 15 miles from Palmer Lake Rec Area to the city of Colorado Springs on the west side of I-25. Part of it goes through the Air Force Academy, which is where we'll camp whenever we visit the area. 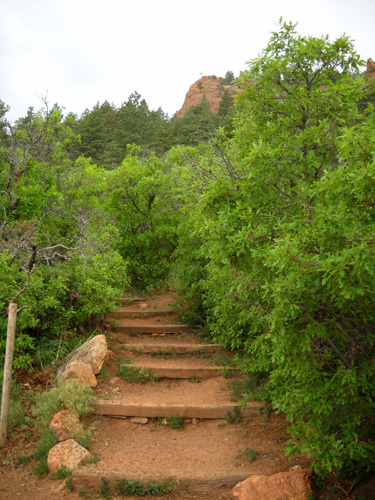 Hike more trails in Garden of the Gods, Red Rock Canyon, and Section 16 open spaces. 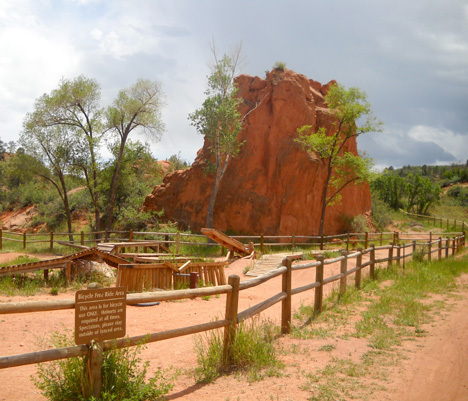 Visit Rock Ledge Ranch Historic Site in Garden of the Gods park. Check out some other parks in El Paso County, like Paint Mines -- only four miles of trails but lots of natural wonders. 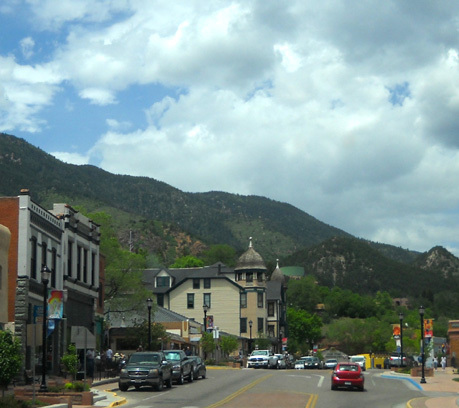 Take walking tours of the Old North End (Cascade Ave. area of Colorado Springs), the Broadmoor area (even more grand estates and the historic Broadmoor Hotel), Old Colorado City, and Manitou Springs. 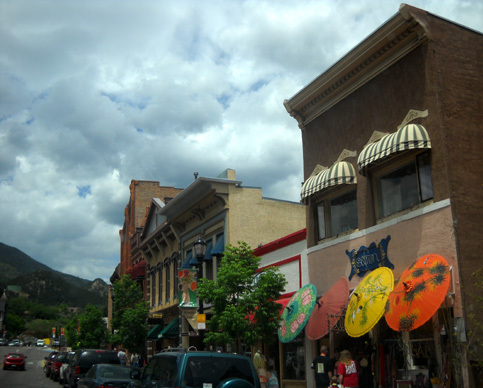 Walk through the historic shopping district in Manitou Springs and eat at one of the restaurants there (we seldom eat out, so when we do it is a real treat). Drive more of Gold Camp, High, North Cheyenne Canyon, and Old Stage Roads on a dry, sunny day. Visit the Bear Creek Nature Center. Check out the trails and waterfalls in North Cheyenne Canyon Park. 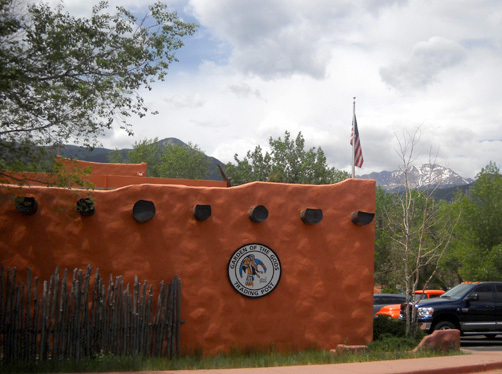 Visit the Colorado Springs Pioneers Museum, an historic building in a beautiful downtown park. Visit the Colorado Wolf & Wildlife Center in Divide, CO, which has one-hour tours of its wolf sanctuary. Visit Florissant Fossil Beds National Monument and Mueller State Park just west of Divide on US 24. See the new firefighters' exhibit at Miramont Castle in Manitou Springs. I've been in this Victorian museum before but now we have a new reason to go since Jim's a volunteer fireman. 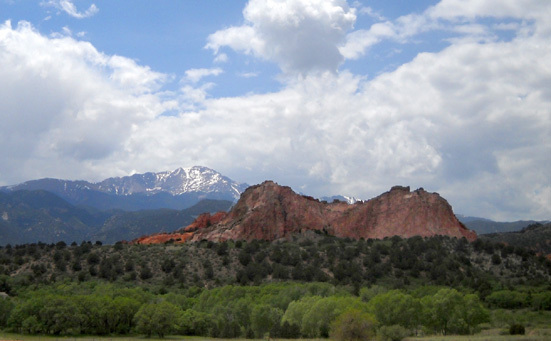 There are many, many more things to do and see in the Colorado Springs area and Pike's Peak Region. Some we've done before, some we haven't, and some we'll never do for various reasons. Wherever we go, I'll probably report on it here if I think it might interest some of our readers. Jim and I have really enjoyed our visit to the Colorado Springs area but it's time to move on. 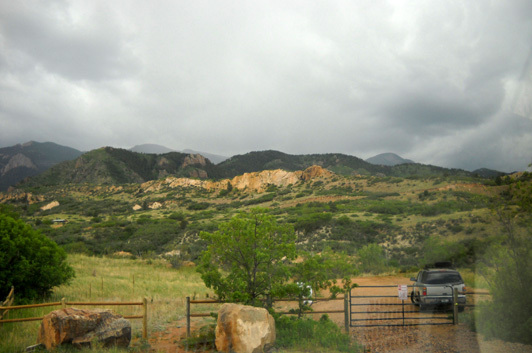 Our next destination is the Dory Hill Campground between Black Hawk and Golden Gate State Park west of Denver. Jim's running a 50K race in that park this Saturday. I've got my fingers crossed that we'll return to Colorado Springs later this summer.